My family likes the creamy sauce of this dish. I serve it over wide rice noodles (most traditional), rice, quinoa, or baked or oven roasted sweet potatoes. 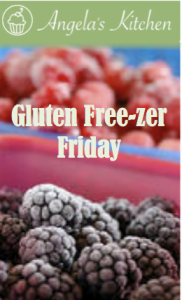 Head over to MJ’s for Freezer Food Friday. If you have a freezer recipe to share that is gluten free, link back here and join in on Gluten Free-zer Friday. I’ld love to have ya join in! I like to double this to eat one, and freeze one for our family. In a large bowl, mix bread crumbs and ½ cup of milk substitute and eggs. Allow to soak for a couple of minutes. Add beef, pork, onion, garlic, 2 teaspoons salt and ½ teaspoon pepper, nutmeg and allspice. Mix until combined. Using a tablespoon, scoop up a rounded amount and form mixture into meatballs. 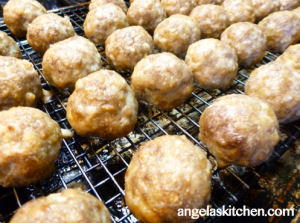 Place meatballs on rimmed baking sheet(s). Alternatively, you can place the meatballs on a cooling rack set on the baking sheet to allow the fat to drain (this is what I do). Bake meatballs for 8 to 12 minutes until cooked through, checking them partway through and rotating the pans. If freezing right away, allow meat balls to cool, then package in freezer bags, removing as much air as possible, seal and label. To make sauce, heat oil in a saucepan, over medium-high heat. Whisk oil and add starch to oil while whisking, cooking starch and oil together not letting mixture brown. Still whisking, slowly add the last cup of milk substitute and beef broth, whisking until smooth. Bring mixture to a boil, then reduce heat and simmer until thickened. If cooking to freeze, allow mixture to cool then put into another freezer bag, seal and label. Package meatballs and sauce together. Label. To serve: If having right away, do not allow meatballs and sauce to cool. 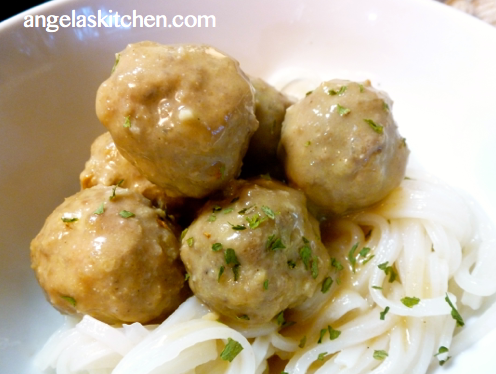 Mix meatballs and sauce and serve over gluten free noodles. Top with chopped fresh parsley, if desired and some lingonberry sauce and a salad on the side. If frozen: Thaw meatballs and sauce. Reheat sauce in a pan, then add meatballs, stirring carefully to not break apart meatballs, adding water or milk substitute if needed to thin sauce. Cook until heated through. Serve over gluten free noodles. Top with chopped fresh parsley, if desired and some lingonberry sauce and a salad on the side.